Irrespective of the nature or size of your business, efficiency is a key element to your overall success. This is especially true for sales departments. Communication with the outside world is unavoidable and absolutely essential. Many companies have a fax machine that is used centrally by all the sales staff members. The challenge with that is that all the messages are sent to the same fax machine and it could take hours to sort through all the faxes and decide whom to delegate the queries and orders. Have you ever walked into a restaurant and no one is at the door to welcome you and help you find a table? Unfortunately this is the reality many customers have to face when reaching out to some business to purchase their products or services through fax. Not only do you run the risk of losing one client, but bad word of mouth could cause you to even lose potential clients too. 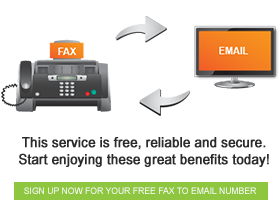 Our fax-to-email service will ensure that your level of efficiency rises considerably. With this service your sales team will be able to receive faxes that are relevant to them individually in their inboxes, making it easier for them to respond to messages promptly. Increase the overall productivity of all your staff members by ensuring that they all have individual fax-to-email accounts. Follow the easy steps on our website and change the way you do business today!